Luke Pierce knows it will take awhile to get over the sting of this season’s ending. The sophomore Kootenay Ice coach is trying to stay positive and look at the team’s year as a whole, but their concluding 10-game losing streak is hard to overcome. The team’s last stretch included 11 games in 18 days and saw the Ice go on their worst slump in what was otherwise an improved season for Kootenay. Despite finishing in last place in the WHL for a second straight year, the Ice picked up 40 points in 2016-17, nine more than in 2015-16, and also saw much more encouraging play from their young players. “I think it’s hard to compare the two years … [we had] similar results, but in a lot of ways we made some strides,” Pierce said. “You look at some smaller things — our specials teams were better [and] we finished this year as a much younger hockey team than we were last year. For Pierce, the highlight of this season was watching the tenacity and resilience of his team’s youth, in particular, 16-year-old forwards Keenan Taphorn, Kaeden Taphorn, and Michael King. “[That’s] one hundred percent [what struck me most this season],” he said. “The way those kids played at the end of the season, when everyone else kind of emotionally shut down, was impressive. While a sophomore slump is always a worry, Pierce doesn’t see it happening. As to what changes will be expected of the rookie ‘mattress line’ in their 17-year-old season, Pierce isn’t quite so sure. “Certainly, I think offensive production would be the next evolution for them, but I don’t know that they’re ever going to be 40 goal guys or 70-80 point players,” Pierce said. “I think they’re going to be a solid foundation on our team. We want them to do a lot of the same things as far as the structure and their approach to the game every day. The coach doesn’t have an iota of concern about their physical development but knows that maturity will be key for them moving forward. The Kootenay Ice’s undisputed leader and MVP all season was their goaltender Payton Lee, but Pierce doesn’t believe his impact will necessarily be felt right away. “I don’t think a lot of our players will really appreciate or realize what Payton meant to our group until later down the line,” Pierce said of the graduating Cranbrook native. “Whether that will be in a year, two years or even not until after they all graduate, his dedication, work ethic, preparation, [and] performance will all start to come back to these guys as they mature. Lee was the point of stability in the Ice’s lineup this season, keeping the team calm and always giving them a chance to win. In 53 games, he had 1707 saves, 10 wins, and a 0.894 save percentage. His back-up, 17-year-old Jakob Walter, was inconsistent, to say the least. After stealing the job from last year’s number two goalie, Declan Hobbs, Walter only picked up 4 wins and finished his rookie season with a 5.02 goals against average and a 0.868 save percentage. “One of the things that prevented [Walter] from being better was his approach. He [thought] he was here to learn and just observe and it was okay whatever the result may be,” Pierce said. “I talked to him [about the fact that] he needs to compare himself to elite goaltenders in our league and want to be [one of them]. Pierce believes that if Walter wants to be their starter moving forward, he needs to show significant improvement. “At times, I thought that maybe [Walter] wasn’t as prepared as he needed to be [but] that’s part of being young, unfortunately,” he said. “When you’re a 17-year-old forward, you have a whole group of people around you that can hide your weaknesses, but when you’re a 17-year-old goaltender, your weaknesses are going to show. The Ice had a clear top line all season, but the only consistent member was Vince Loschiavo. The 18-year-old forward struggled in his sophomore season, only putting up 10 points in 61 games, but took advantage of an opportunity to play with star forwards Zak Zborosky and Matt Alfaro at the start of this season. After they were traded, Loschiavo didn’t miss a beat while playing with their replacements Brett Davis and Colton Kroeker and finished the season with a team-leading 29 goals, and a career-high 57 points. Pierce believes that the most improved part of Loschiavo’s game in 2016-17 was his consistency. “I think again it comes down to maturity,” he said. “We were on [Loschiavo] all year last year because we expected more from him and I think that’s part of being a coach that you learn the persistence of pushing players. As for his linemate Brett Davis, an important piece for the Ice moving forward, Pierce is hoping that the young centreman doesn’t dwell on how his season ended. Although Davis had 22 points in 30 games since joining the Ice, he was held off the scoresheet in eight of the team’s last 10 games, while being -19. 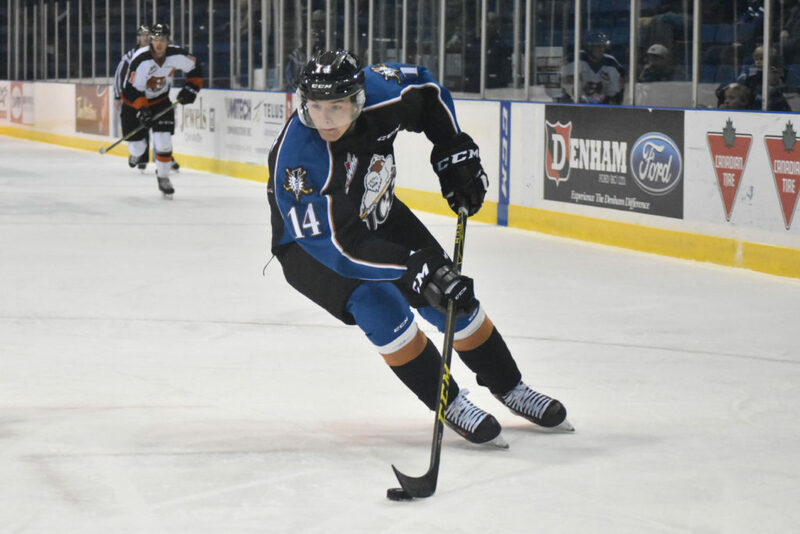 Colton Kroeker, on the other hand, had 32 points in 29 games with Kootenay and staved off a major slump. In his 20-year-old season next year, Kroeker should be a key performer for the team. After spending the first half of the season without a captain, the team assigned new letters following the trade of strong leaders, Zborosky and Alfaro. While Pierce is fully aware that leadership is perhaps the hardest skill to learn, he wants to see more significant strides from his leaders next season. “[There was] not as much [growth in our leaders as] I would have liked or had hoped for, but that’s probably on us as a staff,” he admitted. “I think maybe we didn’t take as much time as we should have to teach leadership and reinforce some lessons there. Captain Cale Fleury had a big season, which is expected to cap off by being drafted into the NHL this June. Pierce believes that putting away the distractions from this season, should do wonders for the 18-year-old defenceman’s ability to lead. “I think it’ll be nice for [Fleury] to have one more thing off his plate,” Pierce said. “I think it was stressful for him, especially down the last stretch here. There was a lot of attention on it, a lot of scouts around, people talking to [him]. Pierce is sure that certain things about Fleury won’t change, however. Two other members of the Ice’s leadership group will be in a unique position coming into training camp. Forward Austin Wellsby and defenseman Kurtis Rutledge are both alternate captains and will be overagers next year. With a maximum of three twenty-years-old on a roster, one of them may be forced onto the chopping block as — with Troy Murray and Colton Kroeker in the same age category — changes will have to be made. And, they could be coming quickly. “There have [already] been some decisions made from our organizational standpoint [and] we’ve let some players know they won’t be returning with us,” Pierce said. “That has sent a little bit of a message to our group that our desire and our need, [has] to get better. There should also be changes to accommodate upcoming talent who didn’t play full seasons with the Ice this year. Last season’s first overall WHL Bantam Draft pick, Peyton Krebs, is a lock to be on the team next year after putting up six points in six call-up games. There were also plenty of other players who impressed the coaching staff in limited play. “Eli Lieffers, Bobby Russell, Loeden Schaufler [are all guys] we’re counting on coming in and expediting their process of learning our league,” Pierce said. “I think for [Krebs], his experience playing in tough games, helped him finish out his year a little bit better. In 29 games with the CFR Chemical Bisons of the Alberta AAA Midget Hockey League this season, Krebs had 40 points, tying him for the league lead. The Bisons are currently playing in the league finals after winning their division. Although Pierce doesn’t want to get too far ahead of himself, he sees a return to the playoffs as a realistic goal for the Ice next year. “[It’s possible but] challenging. You need some things to go your way,” he said. “We hope that we can add some pieces in the Euro [CHL Import] draft [and] we hope that some of the players we have coming in have good years [and] returning guys have breakout years. For inspiration, the coach is looking to teams like the Prince Albert Raiders, who also struggled this season but had a much stronger conclusion than the Ice. “I have talked with [Raiders head coach] Marc Habscheid on occasion this year … they went through their tough patch in the middle of the year and they finished really strong,” Pierce said. “We talked about ways they got through that and really it came down to the strength of their leadership group. He may still be frustrated and disappointed, but even in the immediate aftermath of another rough season, Pierce has optimism in his eyes. Only time will tell, however, if his group has what it takes.